Approximately 250 of the over 3000 photos from the 2001 - 2002 band year are included in the albums below. The remainder were removed to make room for the events of 2002 - 2003. Gala Concert, combined Symphonic Bands from Robinson Secondary and Lake Braddock Secondary, under the direction of Maestro Leonard Slatkin, May 23, 2002, at the George Mason University Center of the Arts. Orlando Musicfest Awards, April 10 - 15: Jazz Ensemble - 3rd place, Concert - III 1st Place, Concert IV - 2nd Place, Symphonic - 1st Place, Band Grand Champion: Robinson Secondary! Mr. Denton Stokes, High School Band Director, named Teacher of the Quarter: "James W. Robinson Jr. Secondary School Certificate of Award, in honor and recognition of your fine performance we hereby present Mr. Denton Stokes with this certificate of award for Teacher of the Quarter on this 20th day of March, 2002." Congratulations! RobinsonBand.org has been named "Best High School Web Site" with the Golden Award by the Virginia Society for Technology in Education. The award presented at the VSTE Annual Technology Conference each Spring, recognizes exemplary examples of web design and resources in the educational technology arena. 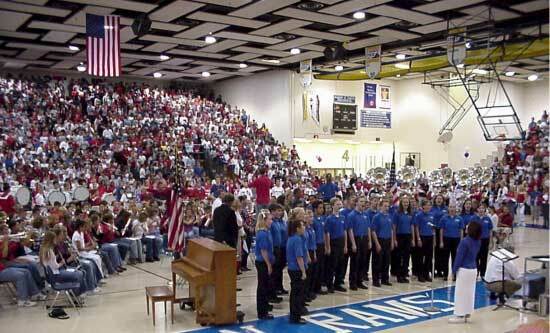 VMEA District XI Band Festival, March 8 and 9, 2002: High School. Congratulations to Robinson Middle School Bands Concert IV, Concert V, and Symphonic for earning Superior Ratings across the board at the Middle School Band Festival, March 2, 2002. Ann Monday, principal of Robinson Secondary School in Fairfax, has been named Outstanding Music Administrator of the Year by the Virginia Music Educators Association. She received her award at a conference in November. Monday attends as many as 24 concerts at Robinson each year and has provided funding for more than 20 musical groups to attend district festivals. Robinson, at both the middle- and high-school levels, was a first-place winner of band, orchestra and chorus competitions during the past year. November issue School Band & Orchestra Magazine featured RobinsonBand.org website.
" School Band and Orchestra Magazine WEB Spotlight Internet Sitings - Casting a Web Presence: Spotlight on the Robinson Band Program, Fairfax, Va."
The Robinson Marching Rams received a Superior Rating from the judges at the VBODA (State) Competition held at Garfield High School, Woodbridge, VA. Robinson marched as a Class AAAAA band in a morning grouping due to Homecoming Activities. Coming off an out of town overnight competition the weekend prior, a week of Homecoming events, a performance Friday night at the home football game, and an early morning rehearsal before traveling to this competition, a huge congratulations to the directors, students and parents for their commitment, focus, and enthusiasm! Competition results for the Robinson Marching Rams: Class AAAA 1st Place Band, Horn Line 1st Place, Drum Line 1st Place, and Grand Champion of combined AAA and AAAA Divisions. The band traveled by motor coach bus to Chesapeake following a morning rehearsal at Robinson, arriving early enough to enjoy watching several other bands perform in competition. Following the competition, the band spent the night at the Holiday Inn in Virginia Beach. Sunday morning was spent on the Virginia Beach Boardwalk enjoying the sun, warm breeze and sand. The Marching Rams captured 1st place in the Class AAAAA Division with a score of 91.3 and first place for Auxiliary, Music, and Overall Effect. Soloists for "A Latin Fantasy" are Marty Humm, mellophone, Chris Buchanan, trumpet and Dan Reip, trumpet. Did you know that the band always completes a full (translation: hard work) rehearsal at Robinson before leaving for a competition? Robinson Marching Rams performing "A Latin Fantasy", "Symphonic Dance No. 3" by Williams and "Cuban Overture" by Gershwin, won all caption awards in the AAAAA Division and placed 2nd for Grand Champion. Robinson marches with 136 Wind, 29 Percussion, 20 Flags, and 3 Drum Majors. Ever wondered how a marching band is judged? Click here to find out! The Robinson Trombone Choir performed with the Lake Braddock Trombone Choir and the University of Texas/Austin Trombone Choir (a total of 76 trombones) at 9 AM on Saturday, March 16, at the Eastern Trombone Workshop at Fort Myer, Arlington, VA (Brucker Hall). On Friday, March 15th, the three choirs spent the day at Lake Braddock Secondary School enjoying performances, a master class, and a combined rehearsal.